Add beauty and value to your home or business with Perth-based Webb Floor Surfacing timber flooring services. We are wood flooring renovation specialists and our wide range of solutions includes the restoration, repair and rejuvenation of all types of tired and worn timber floors. Perhaps you only want to revamp your floors; we also specialise in a number of different floor finishes, concrete grinding and cleaning services. Get your floor redone by our highly skilled team who have many years’ experience with floor repairs and heritage floor restorations. Our forward-thinking tradesman produce professional workmanship using the latest techniques to achieve a superior finish to your home and office floors. Choose your finish from our wide range of flooring products. Several preferred styles are available in a variety of textures and grades, which can be viewed at our showroom. When selecting your timber flooring, it’s essential to know that these require maintenance and treatment to ensure longevity. We provide superior wooden floor sanding, polishing and refinishing. Our clients are always 100% satisfied with the results of our skilled and professional workmanship. When choosing the specialists with experience in sanding and polishing of old and new timber floors, you’re investing in your property. The quality of our work speaks for itself and you will be more than pleased with our timber flooring services. Read more about our professional floor sanding services, or browse our gallery and view our examples of home and commercial floor sanding projects. We will create that perfectly smooth floor surface, ready for treatment and polishing. Your home or office will not only be ready for use after we’re done, but our dust-free timber floor sanding techniques ensure that the dents, stains, chips and worn feel of your floor are replaced with a smooth, glossy and even surface. Inject new life into your floors with our timber floor repair and restoration services. Those deep cracks and flaking polish will reduce the value of your property and be an aesthetic nightmare. Timber floorboard restoration includes the removal of stains, old polish and years of grimy build up, and the repair and restoration of the surface with a new sealant, leaving you with an entirely new timber floor. Bring your wooden floor to life. 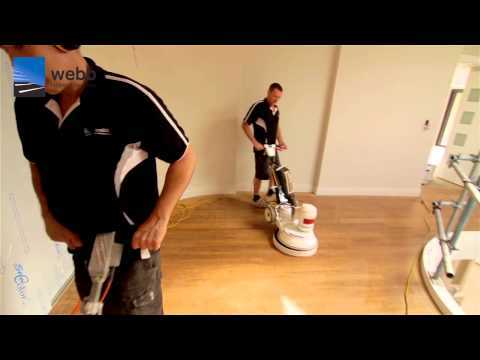 Polishing timber floors is a specialist job and our team is more than up to the task with our dust-free equipment. Our vitrification and polishing guarantees a glossy finish. Using advanced techniques and varnishes available in a variety of colours, you will be treated to an overhauled and stylish floor. Concrete flooring cleaning is a specialist service that requires particular equipment and chemical applications. We’ll clean your battered concrete floor and turn it into a stunning polished surface complete with sealant and colour – per your choice. Concrete cleaning gets into those cracks and removes unsightly bits, leaving any uneven concrete surface with a smooth and clean finish. The benefits of wooden floor resurfacing means they are easy to clean and they look stylish. Our team will secure loose wooden strips or blocks and remove any old surface finishing with dust-free sanding techniques. Refinishing different timber floors including parquet, mosaic, hard and softwood of various textures produces exceptionally stylish characteristics. Enjoy a stylish new timber floor with Webb Floor Surfacing products and treatments. Our specialised team is on hand to assist you. Contact us today.